Two pictures taken of posters for the Shanghai event were just sent to us (thanks Isaac for all the shots). 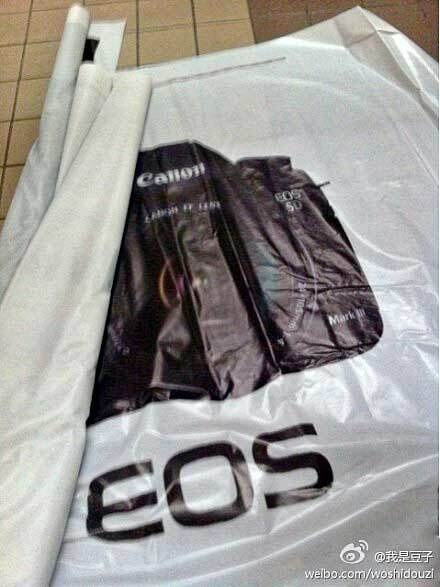 More pictures of the Canon Shanghai event being set up are also posted in a forum [CR]. BTW ;-) …We won’t be running/streaming a live event from the Northlight Images garden shed, discussing press releases over mugs of cocoa, like inane early morning radio hosts. Nor will we be doing any phone-ins or competitions. It’s just a camera announcement – we have lives ;-) In fact I’ll probably be sound asleep at the time. Go out and take some photos with what you’ve got! 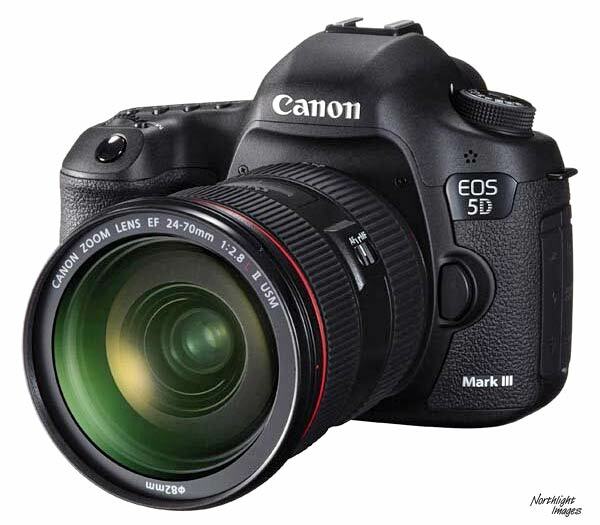 I know of several people with pre-orders in at dealers for the 5D3 (based on strong hints of the specs, not just ‘I want a 5D3’) – all emphasised the ISO/AF/Video improvements as the features they were looking for. Anyone care to share any more invites to press events? Open image in new window to see at full size. 26th Quite a few people are asking where the leaks are (even the minor ones), if we are only two days from an announcement? One Canon event in Shanghai on the 2nd is supposedly entitled ‘IXUS Night show’. …however I’ve still not seen an actual invite to an event. 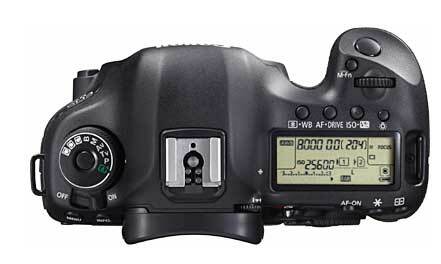 “Although the AF in the 5D2 replacement is based on the same sensor layout as the 1D X, it is a ‘simplified’ version. My suspicion of Friday announcements seems shared. Next Tuesday (28th) is now a favourite [CR] at 22MP, dual card slots and $3500. 20th We’re hearing of NDAs expiring on the 2nd of March. After several different suggestions pointing to the start of March I’m wondering if we will indeed get an announcement on the 2nd. Fridays are not a traditional day for announcements, but perhaps we will see a 5D3 celebrating 25 years of EOS? As ever with pages I can’t actually read, they could be versions of current rumours re-circulated or new stuff – thanks for sending however. The 26MP it seems, may come from a 2011 rumour … all goes to show how this stuff swirls round and gets rehashed [CR]. Worst offenders by far a many of the ‘tech blogs’ who seem pathologically averse to giving any form of credit or sources for their info. 17th We’re getting numerous comments to expect an announcement in ‘2-3 weeks’. Actual dates vary though, and we’ve not seen any press invites yet. It seems Masaya Maeda (Chief Executive of Image Communication Products Operations), invited some CP+ journalists to visit Canon’s headquarters in Tokyo. He commented the following about D800 and 5D2’s successor. 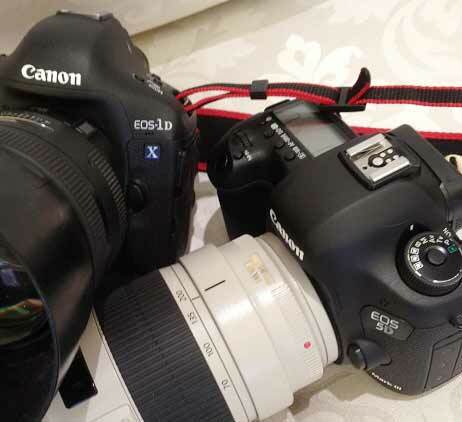 9th Years ago, the 1D line split into the 1D and 1Ds – we’ve had a suggestion (thanks) that this will shortly happen with the 5D – a 5D3 and 5DX. 2nd Release date rumours we’ve received continue to run the gamut of next week, through to the Autumn. Little new reliable info as to specs, although most comments received seem to be going for 18MP or 22 MP. 31st A suggestion received (thanks) not to expect deliveries of a 5D3 until October. 25th Once again, we’ve been hearing (thanks) that the only DSLR for CP+ will be the 650D/T4i and that the 5D3 won’t be announced until after the 1D X ships… As to the 5D4 – who knows? I’ve seen no firm dates -yet- for any Canon announcements that suggest otherwise. 24th We’ve had several more comments saying that the 5D3 will be announced before CP+ at the start of February, although some are still suggesting a few months time. 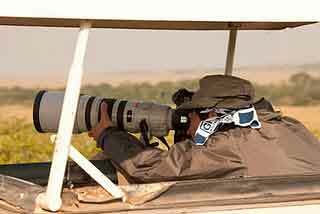 In a followup post [AA], there is more information from Stephen Oachs, who took the photos in Kenya. He’s made a RAW version of one of the photos available and emphasised his lack of connection with Canon. I wish I could say that large crowds of camera fans on the internet were all reasonable and rational people, but given some of the bizzare comments I’ve received in the past, I’d just wait for it to blow over and for the next thing to hit the news. being tested with a new body that might be the 5D3 [AA] Lens launch is slated for March/April. Or is it a 7D mk2? We’re also getting slightly more detailed suggestions for the 5D2 replacement, with several pointing to 22MP (or virtually the same as in the 5D2), and one even adding “61 Focus points (41 Cross) same as 1D X, 100-25600 Basic ISO, 6 fps” – Suggested date was March 7th. Sounds much too close to the 1D X specs which still won’t have shipped by then… but I’m still getting MP estimates from 18 to 40. Note this 5D3 info [TJO] which has no indication of sources, so I’m not sure to what extent it’s based on other stuff I’ve seen [CR via Egami] or get sent. Just saying… navigate the rumoursphere with a good deal of scepticism. 20th Several comments have suggested that an all new version of the 24-70/2.8L will be a kit option for the 5D3 (or 5D X as several would like to call it). I note that 24-70 replacement rumours pops up very regularly, although this time, IS hasn’t been mentioned. I was just looking at the archives and notice both 24-70 and 100-400 replacements being mentioned back in 2007. 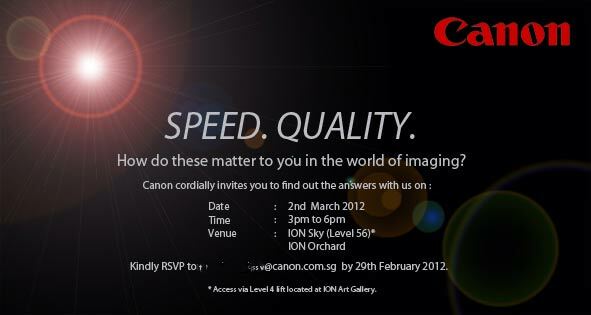 I’m going to the show, which also should also see Olympus’s new take on the ‘OM’ brand and maybe a D800 on view. I’m not rating this 5D3 for Focus rumour too highly at the moment, given we were told that it would appear -after- the 1DX started shipping. 18th Whilst there was lots of chat about the 5D Mk2 replacement at the recent PMA/CES show, I’ve seen little in the way of sound rumours or the degree of concerted ‘leaks’ that we’ve seen for the D800. BTW We’re still getting sent regular ‘rumours’ for a camera that will be announced some time between next week and the Autumn, with anything from 18 to 42MP. 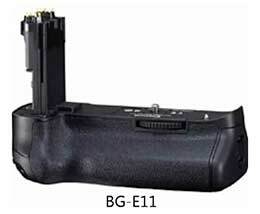 9th With mirrorless info and the new Canon G1X, it’s been noticed that Canon’s raft of press info today did not contain any EF lens or DSLR related news. The next trade show in the list would be CP+from 9-12 February 2012, at the Pacifico Yokohama, Japan, but the only suggestions we’ve had was for a 650D and maybe a lens or two. No 5D2 replacement hints at all. 2012 January 1st New years greetings to all visitors! 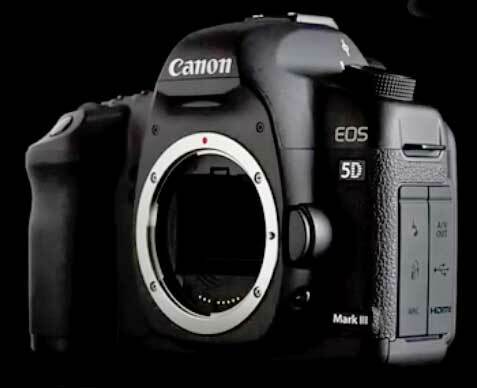 I’m minded to believe that we will finally get to see a replacement for the 5D mk2 within a few months (but not until after the 1D X ships). We’ve had suggestions that the 5D2 replacement will not be a particularly high megapixel sensor and that the success of any high MP Nikon D800 will influence the arrival of a high MP EOS camera, but not this year. 28th We’re told (thanks) to expect a 5D2 replacement ‘in our hands’ for the summer, and that the 7D2 is slated to be ‘one of’ photokina’s star products for Canon . Interesting to see that there seem to be two current schools of 5D3 rumours big MP or 18MP and video. All the high MP rumours we’ve seen so far though have been much more of wishlists than the 18MP ones. 29th We’re told (thanks) that the 5D2 replacement will be aimed at ‘cleaning up’ in the DSLR video market, complementing the video specific 1 series mentioned at the recent Hollywood announcement. It was also suggested that it would not be any more than 18MP, and that any higher MP camera was ‘quite some time off’. With no details on specs, I’m assuming that any 5D3 isn’t coming in the next few months. 19th Whilst we’ve heard of some bodies being out for testing, at CR they’ve heard of at least 5. Most 5D2 replacement comments we’ve had still point to an August/September announcement, although at CR they mention Summer ‘availability’. Whether Canon will pull back from their current strategy of announcing higher end products long before they are available, remains to be seen. How much of this is cynical marketing policy and how much genuine difficulties resulting from events this year, remains unknown. 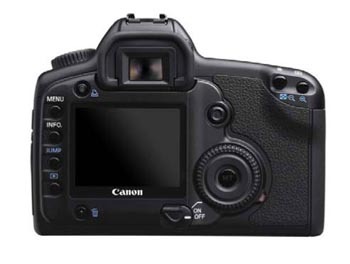 8th The next DSLR we’re expecting from Canon is the 650D – February? No signs yet of any full frame camera until well after the 1D X is shipping. 1st At CR the 5D3 is back to photokina 2012 with a 1Ds4 for February. My own thoughts are that it will appear at Photokina next year and I’m still of the opinion that the recent 5D2 price drops are a (successful) effort at boosting sales volumes, not clearing stock for an announcement. I’m minded to say that I’m still not convinced we’ll see it quite so soon. 17th We hear (thanks) that in one part of the world at least, dealers are being offered substantial discounts by Canon, for bulk purchases of the 5D2. There were also more hints that PMA/CES might see an announcement – although a 650D with Digic 5 would be likely too. Won’t be using the same sensor – 5D3 is evolutionary, but 1Ds4 is seen as big jump. Designed to complement each other. 27th I’ve been sent what was supposed to be a 5D3 ‘teaser advert’ – pity it’s from the 5D2 adverts in 2008. If you want to see the rumours that led up to the 5D2 announcement, there is an archive page covering 4th June 2008 to the 16th of September 2008. If we are to see a 5D3, then expect to see attempts at building interest, starting a couple of weeks before an announcement. I -still- don’t buy this, all our comments received from non anonymous sorces say that it won’t appear until after the 1Ds3 is updated. 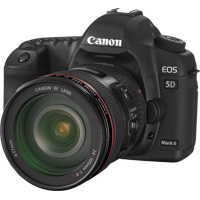 In the UK Canon are still selling the 5D2 as fast as they can be supplied to dealers – stock doesn’t last for long. 19th Several reports (thanks) of price dips on the 5D2. The kit version with the 24-70 is no longer available in the UK, but I’d take that as more indicative of a new 24-70 on its way. 6th A recent email suggests that the 1Ds4 will be 37MP and that the 5D3 will be 28MP and announced at the same time. However, on the balance of what we hear I still don’t believe it will appear before a 1Ds3 replacement. Also at CR there are suggestions that versions of the 5D3 are currently out for testing. 14th Some time ago we were told about a number of 32MP 1Ds4 prototypes undergoing testing, but were pulled as not being a big enough technological jump – it was felt that the 1Ds4 had to be pretty special to make a noticeable jump from the 1Ds3 (yes, I’d agree there from my 1Ds3 use). This 32MB sensor (or a derivative) is a candidate for the 5D3. 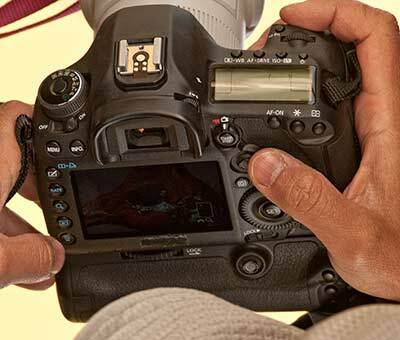 If a 40+MP 1Ds4 appears, then I’ll not be surprised to see the 5D3 not too long after at 32MP. Note that we’re getting an awful lot of ‘bits’ of info at the moment – it just isn’t clear which (if any!) have a good take on what’s going on. 11th “The 5D2 is still selling too well” was the only comment I got from a European source when I mentioned that a lot of people were waiting for it’s replacement. None of our usual sources have said anything about the 5D3 as anything but ‘later this year’. Favourite is a 1Ds3 replacement for ‘Q2’ or even March. 27th Althought there seems to be a lot of 5D3 ‘really soon now’ type suggestions going round, Canon would still seem to be trying to keep up with 5D2 demand [DPR]. I’ve still not seen any solid information suggesting it will be replaced earlier, rather than later in the year. 20th A source at [CR] puts the 5D3 at 28MP and a spring announcement. 13th We’re told (thanks) to expect an early September announcement, whilst at CR there is the suggestion that the 5D3 will move a bit more high end with an improved 7D AF system. They suggest Nov/Dec, which whilst an odd time for an announcement, fits with the announcement date we were told. 17th Not one we’d heard of, but a ‘Canon Rep’ comment about the 5D2 production being over and supplies low [POTN]. Seems a bit soon given how well the 5D2 is still selling? 11th A batch of misc info at CR, suggesting a 5D3 in 2011 (well, it will be 3 years old), but will an improved 5D3 come before a replacement for the 1Ds3? 20th At [CR] there is another suggestion that the 5D3 will come before the 1Ds3 replacement – possibly as soon as March. Whilst ‘next year’ is still the only date we’ve had, I find difficulty in the idea of a 5D3 leaving the current 1Ds3 far behind in functionality, unless it’s alrady been replaced and the new camera is shipping. The same article suggests that the next Ds will be late 2011 or even 2012. 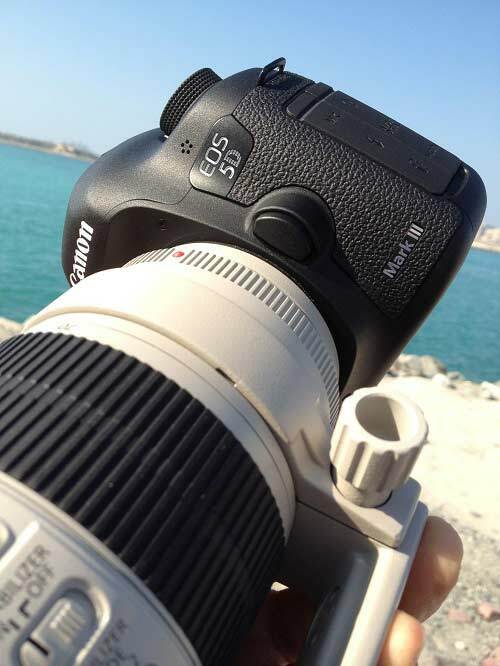 1st Talk from the Canon expo [PB] says that the 5D3 is not going to appear for some time. Certainly not this year. 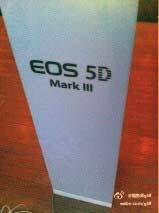 14th We’ve had lots of comments (thanks) pointing to shortages of the 5D Mk2 and asking if it signifies a replacement on the way? What this says about Canon distribution and dealer relations is one thing, but our enquiries led to a resounding “no update for the 5D Mk2 this year”. 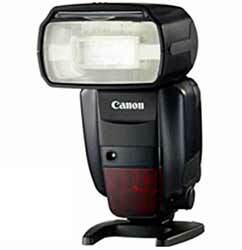 4th At CR there is a mention of a new ‘hybrid’ camera for September and hefty rebates for the 5D2 in Canada. There are a lot of ‘refurb’ 5Dmk2s in the Canon outlet shop at eBay UK. No real signs of a 5D Mk3 yet though. 17th A suggestion [CR] that the 5D3 is dependent on the Nikon D700 replacement and may be here this year. If a 1Ds4 is available before Photokina, then I might expect to see a 5D3 announcement earlier -next- year, but with the recent 5D2 firmware upgrade I see the chances of a 5D3 this year as pretty slim. 7th A 5D3 rumour [CR] suggests that it won’t be three years between 5D2 and Mk3. The thought is that a new camera is needed for more advanced video features and that the release schedule has been bumped by six months. 15th There’s been an upturn in 5D3 comments, along with a few looking for a ‘2n’ type update. The ‘n’ update is always popular once a model has been out for a year or so, despite the fact that Canon only did this once for the 1Dmk2. 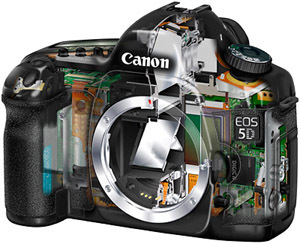 1st The feature packed 7D announcement has left some wondering [DPR] if the 5D3 will come any sooner. 17th Good to see a POTN 5D3 rumour thread, and already someone has slipped Eye-Control AF into the specs. PMA 2010 (spring) or Photokina 2010 (autumn) and it will see the appearance of Digic V. The new versions of the 1D3 and 1Ds3 should be here next year. 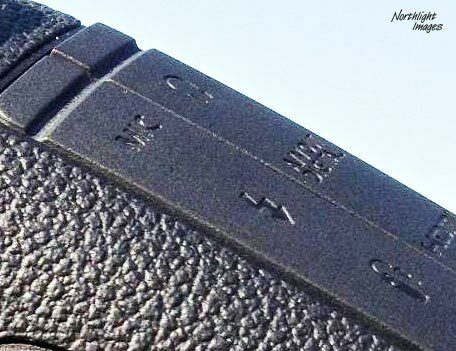 Look for the 5D3 using the same 35+MP size sensor as the 1Ds4 but a year after it. 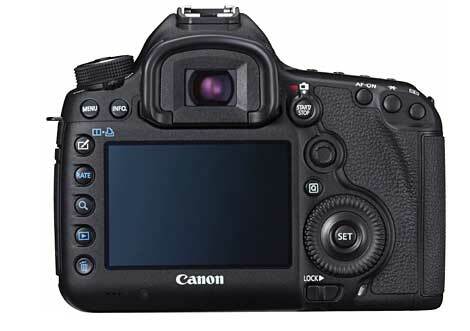 See also our recent technical Canon info on the 60D and 1Ds4 pages. 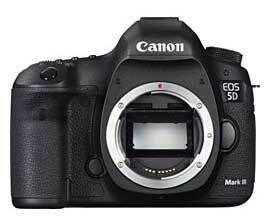 18th OK – the 5D2 has only just been announced, so what about it’s replacement – will we get an EOS 5D mark 3?